In late April at San Diego City College over two-dozen students quickly mobilized after learning that Border Patrol agents would have a booth at the career fair. The students solicited support from their professors, who also reached out to community organizations, and planned a public demonstration at the Quad where the career fair would be held. On the morning of the career fair, several students reported seeing Customs and Border Protection (CBP) officials setting up a booth at the Quad – (CBP is the Border Patrol’s parent agency). By midday, however, Macy’s store representatives occupied the booth originally assigned to the CBP officials. Border Patrol and CBP recruitment agents were nowhere to be seen. Everyone speculated that City College administrators learned that the developing student protest wasn’t just a gripe by a handful of disgruntled students. Rather, the disapproval had become a generalized objection to the presence of an agency tainted with an abusive history. Administrators had already received a disapproving email from one faculty member, and they probably consulted with CBP about wanting to avoid controversy, so they packed up and left. 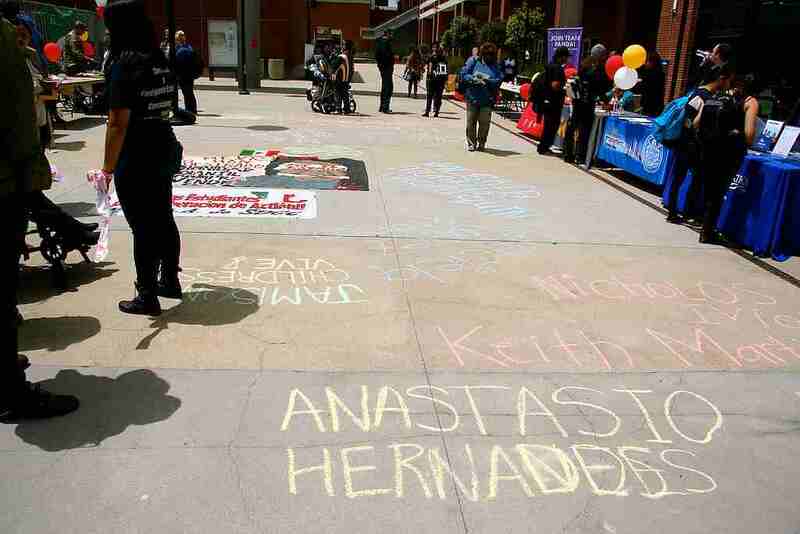 Students scrawled the names on the walkway of those lost to border enforcement brutality. The students moved forward with the protest repudiating the Border Patrol on their campus. They held a banner with painted images of people killed by Border Patrol agents at the walkway bridge above the Quad while a modern dance performance accompanied a poem read by a student. Student speakers took turns at the megaphone remembering the victims of Border Patrol violence as other students scrawled their names on the walkway floor. Anastasio Hernandez Rojas, Valeria Munique Tachiquin, Francisco Ceseña, Jose Antonio Elena Rodriguez, and many more — each name was a reminder that a human life was needlessly taken away, and where justice continued to be elusive for the victims’ families.